I'm going to try to keep this brief because its not at the really cool stage yet. We're starting this segment called FrivGarage to share some pictures and talk "shop". It's just a series on garage equipment and improvement ideas that you might like. 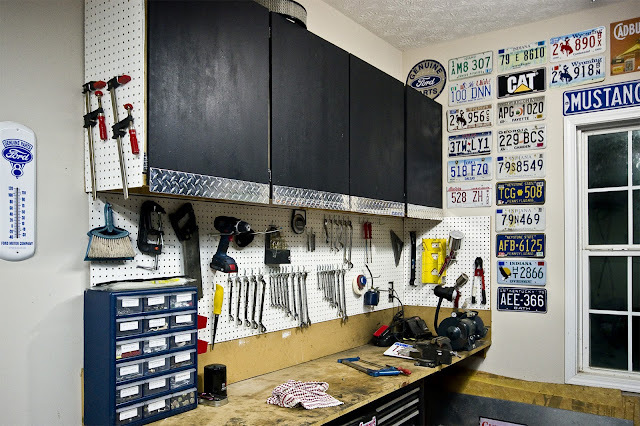 The emphasis is on low budget ideas for the typical 20x20 home garage that enhance the workspace making you want to work on your car instead of playing video games or looking at cats on Reddit. This short story of enlightenment starts with me thinking I had it all figured out. I bought my house new in 2004 and within weeks had installed a couple of hanging strip lights from the home depot. They were cheap, bright and easy to install. I simply wired them in to the existing bulb holders and hung them from some hooks that I screwed into the ceiling. It was a simple project that involved no research and very little swearing, quite a triumph for a compulsive ruin-er of everything like me. I recently decided to add more lights, turn them 90 degrees and use some slot angle to hang the chains from. This would turn my lights into crude "track lights", and give me something to mount more lights to as needed in the future. You can see below it makes a handy place to put a clamp light. This one is plugged into a socket adapter so it comes on with the strip lights when I flip the wall switch. When I went to buy the extra strip light fixtures I noticed things had changed a lot in 9 years.The lamps I installed in 2004 are T12 40Watt fluorescent bulbs. In 2012 T12 lamps were made officially obsolete by the department of energy, replaced with more modern thinner T8 bulbs which use only 32 Watts each. You can't use T8 bulbs in the old T12 fixtures (they will fit but the old ballasts will dramatically shorten the life of your nice new T8 bulbs). Most new fixtures are now T8, and most of the bulbs are too. However the T12 stuff is still on the shelves, I don't know how much longer they will be there but I assume the manufacturers don't make them anymore. I thought I would just buy what was left of the dwindling stock of T12 fixtures but waited till I could do some research at home. I was worried that the new 32Watt units would look dim compared to the bigger more power hungry T12's. Boy was I wrong. Not only are the T8's slimmer than the T12's but they output more light per Watt. So even though they use less power they put out about the same amount of light! 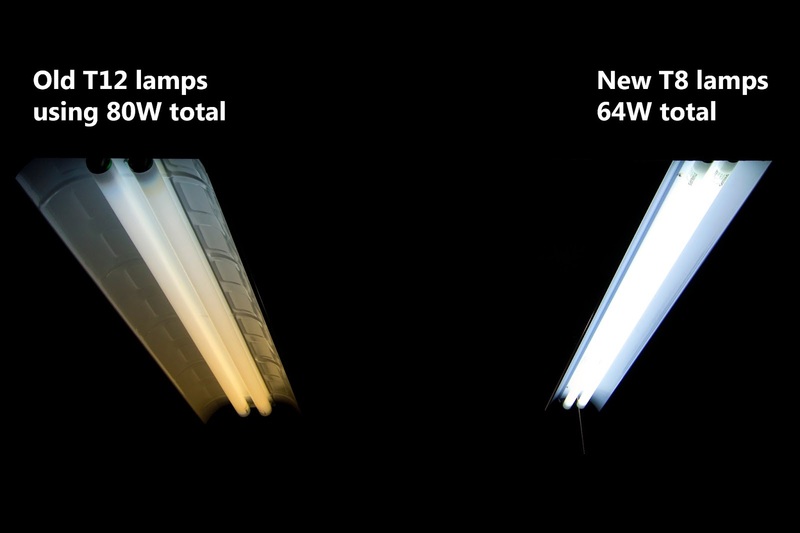 Not only are they more efficient, but the lamps maintain their rated output longer, while the T12's dim over their lifetime. The newer T8's use newer electronic ballasts and start faster, run quieter (no humming) and don't flicker or have a green color cast. They even start just fine in freezing temperatures, while the T12's would be blinking and suffering. The T8 lamps are better in every way from a T12 lamp. If you go looking at shop lights make sure you buy T8 lights, NOT T12. Its that simple. The newer skinny lamps made the T12 obsolete because they are better in every way you can think of. The price is also about the same and the T12's will probably get more expensive as the supply dwindles. I couldn't help myself and went out and bought a T8 fixture to add to my new slot-angle rails . 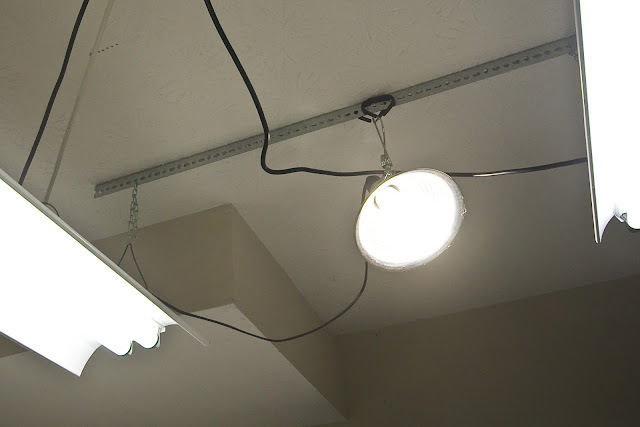 Here is a picture of a new T8 light next to the older T12 light in my garage. I used a manual camera setting with the exposure dialed way down so you can see the difference. Maybe this just saved you from buying the wrong kind of shop lights for your garage. If so, you are welcome, throw us a bone, subscribe to our awesome blog, "like" our facebook page or tell your friends about your new found knowledge. If not I just wasted about 5 minutes of your time. Sorry about that. No really you can stop reading now, you're just making it worse. Go back to looking at cats on Reddit.